There are many memories when one is growing that are pleasant & many more that are worth forgetting. Most often as we grow older we forget the bad ones & try & hold onto dear ones…I’ve tried to clear my memory of most experiences- good or bad…however some stand etched permanently. I went to Surat & then to Bilimora on this weekend. For most Bilimora is the station after Valsad on way to Delhi. Bilimora is a far off suburb for the richie rich Navsari Parsis & Gujjus. There were industries & remaining were farmlands; it was a weekend getaways for the Navsariwalas. Now Bilimora is a town which is unique – gets hot in summer & really cold in winters. It has a some river side area …small compared to even any stream in the western ghats. The drinking water tastes awful. Its salty, terribly hard for Bombayites like me. It was traumatic to say the least. I’d get Nightmares & was always ill. My aai’s (mother’s) maternal home wc was actually a palatial villa. See, there are few secrets of the family which I can’t reveal..some I may just let out…but believe me when I say palatial its NO exaggeration. It was 52 rooms like old palace…No rickety stairs but many swings..remember ayega…ayega?? (Old Hindi film). Ok so on the Gandevi road to the left was this Sardesai villa –Lokesh Bhuvan. On Monday morn it was a mission for my cousin Milind & me to make our trip come true! Our maternal uncle’s daughter made contact wt me. She & her crafty, schizo husband called me one night persuading me to come to visit them. Now my last memories of this house, nearly 28 yrs ago, was what I remember… a beautiful memory that was, till I saw the eventual reality. I NEVER wanted to go there after the 50th wedding anniv of my grandparents. By which time I had got the power to say NO! Didn’t want to re-visit a place where I had memories of being abused. Physically and sexually. Yet, my cousin, my mother’s younger sister’s son was my support. He & i have been buddies since childhood and he convinced me to go. We made a plan & I informed Sonali & her husband…they were all gungho, till they realised I wont be coming alone…they informed me –after I had made all the train bookings that “pl don’t come, We won’t be in Bilimora, we have to go to Ahmedabad for an unlimited period of time.” I called Milind & he said I shld come to Surat, only to prove a point we should go to Bilimora. Yes, both our instincts told us that this was all a BIG lie, no one was going anywhere…they did NOT want us to come. We both wanted to make a point. But you know what, NO one can deny us the right to visit our maternal grandparents home. Bcoz of our mothers, all cousins, till I was born, were born either in Surat or Bilimora, bcoz cousin’s father was a fine gynac. I was the first to be born in Bombay. Now before i had left i had heard of ghostly stories about the place – it was in shambles, NOTHING of the past was around. The villa had become a shanty, the gardens, lawns were sold out since the maternal uncle was in heavy debts; Lot was taken away due to those debts and most of all, most was eaten away by white ants. It wasn’t the place of my childhood, yet I wanted to see it with my own eyes…Surat was fun as usual. I realised Sonali & husband helped me save my money….I didn’t take them any brownies from Theobrama – the place which would make Bombay’s best brownies – that I had taken for cousin’s family. On Monday morn, we embarked on our journey. First we met the bhaiyaji who had worked at my cousin’s house since we all were small….an old man now has cataract but was his old self…who recognised my voice and name! we took photos with him & saw the cloudy skies clearing. We both looked at each other & said let’s go & ruin the plans of our relatives. We crossed Navsari, the sister city of Surat & postponed out sweet shopping trip…we discussed how we would be welcomed or not. As we hit Gandevi road, we were puzzled, we drove past trying to identify the structures. To our right few metres down the road, was the 3 and a half room shanty, that which once was a 52- room mansion! The entrance was no more muddy, there was NO playground. Alas! The blue Ganesha temple is now re-painted in beige, but closed with a huge lock. Although exclusive Sardesai family temple, it looked like NOBODY’s ever gone there…the trees around were chopped or had simply died. All plants around the bungalow too seemed to have died. The shock for me was that the garden was barren land! It was all naked and exposed for the world to see, like the lives of my surviving maternal uncle and aunty. Some part has been leased out by my good-for-nothing uncle, so that he can sit on the arm chair & get money in his lap. The garden, thick lawn, trees are reduced to some green & muddy spot. The house still has the old grills and design, but as we approached, I saw that after 28 yrs this is a concrete shanty wc is worse than the slums of Bombay. The board which said “Trespassers will be prosecuted,” too had disappeared. How do I explain this place, which once was straight out of a fairyland! A fleet of 11 cars, lined this entrance, greenery that would make environmentalists proud! A variety of flowering plants, trees that bloomed as my dada ajoba would talk to his plants. Board which said, ‘Trespassers will be prosecuted, beware of the dogs” fascinated us always. In addition, a mini maidan, huge compound, open space ahead and behind, a compound for dogs plus cattleshed…it was absolutely unbelievable, the amount of land owned by my grand parents. And ofcourse the mango wadi, which was near some river. 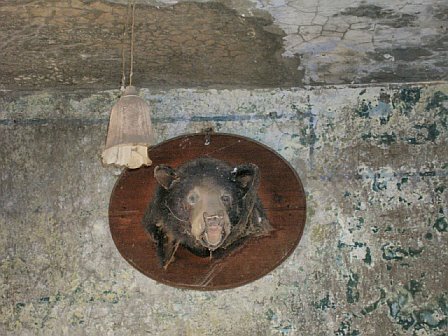 Today, atthe entrance of the bungalow, a stuffed Bear’s face juts out – just like the olden days, yet the lamp is broken, walls are discoloured, with patches & black spots. The rest wc used to be a guest room with bath tub, my dada’s room & the hall, all of it is destroyed. The god’s room stands closed. Don’t know what’s hidden inside. Then a 30 -40 ft verandah is now reduced to 5ft where 2 Labradors are tied…the dogs’ kennels, playing ground and a compound is no more. It looks as if this shanty is an encroachment on a huge mass of land which once belonged to Sardesai family. A lady forced to expose herself due to compelling circumstances. The servant’s quarters, the 3 extra rooms of the kitchen, the store rooms, other rooms…all gone. We looked to our right & the entrance is still dark & dingy. Sudha maushi’s room & aaji-dada’s room wt their toilet is there, rest, NOTHING. It is NO surprise we were NOT welcomed. What I noticed was the uncle’s lordly fascinations of keeping dogs, sitting with his legs up still continues. The 2 Labradors barked their lungs out…the hall has the same black & white checkered design tiles that my grandfather had built, are a proof of the quality of olden days. The blackboard of my cousins, too was intact, but not the rest. So was a lot of wooden furniture. I was told, most of the furniture and entire villa was destroyed by white ants. The 2 beds & cupboards and the desks of kids is there…one bed is turned up against the wall & there sat Aditya in his wheel chair. A grown up son, rather an attempted abortion gone wrong. Sad, he is a challenged man. The maternal uncle was sprawled on the grand arm chair that belonged to aai aji-dada. The dining area, where the entire family of over a dozen sat together for meals here, once is barren. One gas range in the old place & the kitchen is now shifted outside. Behind the table the wash basin & grills remain . Rest is all a vacant land! NO factory, but a new bungalow and few houses are seen 1000 of metres away. Milind told me aai’s & his mother’s rooms were intact…but it was out of bounds for us. My maternal uncle seemed terribly upset upon seeing us. Me especially 🙂 Mami who I feel sad for, yes despite her silent support to that crafty b@#%&*@$d who is actually her brother-in-law, but left my older abusive uncle for this monster, seems resigned to her fate- consequences for NOT making a change for herself & letting herself live in this strange house….I feel bad for her, though she seems happy, even with the actions she has taken. Guess she has resigned to her fate. Ok, he has been a monster with me, but has loved her always, so I guess she will have a soft corner. We both spoke after like 28 yrs??? It was my uncle’s b’day a few days ago and she made sweets & offered us. We both ate reluctantly…that man refused to look in our direction. He has NO idea that the most eccentric nephew & niece were on his doorstep, especially the niece…I can IGNORE people wt such elan, he will be surprised. Later some sense dawned on him & he stood up to talk to us.. he had worn a shirt wt 6-7 holes…his teeth discoloured & mouth filled beetle nut, as usual. My picture of this mama has been one, where he would be standing facing the windows at the end of the hall, cutting the beetle nut with the nutcracker. His fingers stained, dark red-black like his teeth. Milind & I took pics and I played wt the dogs for a while. The dogs were besotted by me, seemed rather lonely. Milind smartly took sonali’s numb & called her in front of them. The colour on aunty’s face turned ashen, the first rains washing the dirt on the leaves! She tried to tell us the same story, they were to go somewhere and she realised the contact was made. Sonali answered the call. We gave her no time to react and simply said we are on our way. Meanwhile mami said we could meet Bondre kaku (the cook of yesteryear’s) & her daughters as we left…the call from Mapara household rang instantly as we were leaving. It was a visit that churned so many emotions and memories for all. What struck me the most was, this family has simply NOT come to terms wt the FACT that what goes up can come down. There are NO more landed rich and feudal lords. One has to work hard for one’s living..simple rule of life wc the men in this family NEVER understood. They wanted it all easy, as if privileged and their birthright. To the extent, they would have even got us to sleep wt other men for fulfilling their own goals. Thankfully the women had more brains. Especially my aai who got out from there rather early-college days. The interesting part is, the current rate for property in Bilimora is Rs 110 per sq ft, (under 3$ per square feet!!). From 52-rooms, the villa is down to 3 and a half room shanty. What more evidence do these relatives need to learn their party is OVER. Who would want to come & live here? acres and acres of barren land. The Mapara household was funnier, as Manish the husband, my so-called brother in law, a crafty man, ran away. We were only offered tea but we never saw anything at the table served for us. We then headed to Nandan Math, an ashram that once was promoted by my dada ajoba… there we were treated better than our own ‘relatives.’ The former cook and her daughters recognised Milind & me. They gave us tea & sweets!! Mostly they made us feel at home in their 2 room cozy chawl room. Despite living in an ashram, they were warm & down to earth. They related to us as if they were our real family. They know the family’s secrets & truths far better than the ‘players’ themselves.